Riot Games has been teasing Zac, the Secret Weapon for a good amount of time now, and it appears as if the team has finally readied themselves enough to reveal the next League of Legends champion. 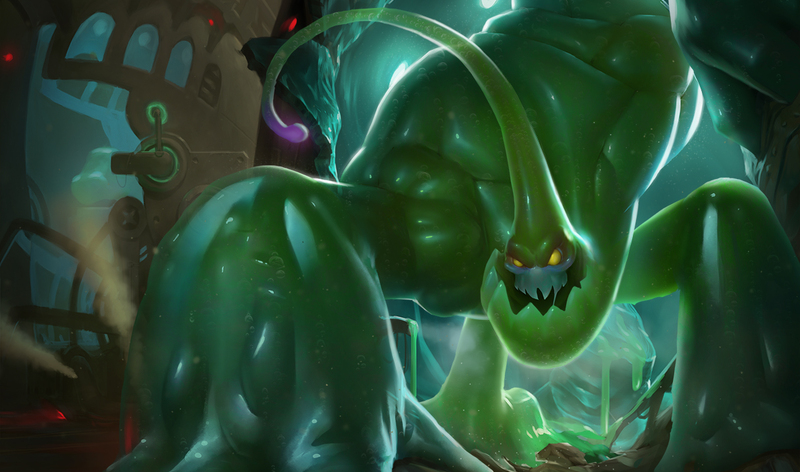 Zac seems to be very similar to Mundo, with each attack that he makes costing him an amount of his health, but unlike Mundo, he can pick up the majority of the health that he loses. He also has a mechanic similar to Anivia with the ability to revive with a portion (or all) of his health based on damage taken. On that note, let’s take a look at his abilities. Cell Division (Passive): When any of Zac’s abilities hit an enemy, a piece of him falls to the ground. Zac can pick up fallen pieces to recover health. When Zac dies he splits into four blobs. These fragments will attempt to reform over a short duration. If any survive, Zac revives with a percentage of his maximum health based on the number of remaining blobs. Stretching Strike: Zac throws a two-handed punch that deals damage and slows targets in a line. Unstable Matter: Zac’s body explodes outward, dealing flat damage to surrounding enemies. Enemies struck also take damage based on their maximum health. Elastic Slingshot: Zac is immobilized as he charges up a dash toward the target location. The range of Elastic Slingshot increases up to a cap as Zac charges the ability. Zac then fires himself towards the target location, damaging and stunning all nearby enemies upon landing. Let’s Bounce: Zac bounces into the air, immediately knocking up, slowing and damaging nearby enemies. Once airborne, he bounces three times, dealing damage with each impact. Riot has envisioned Zac as a potential top-lane of jungler, which is how the recently released Vi began. It will definitely be interesting to see where Zac ends up and how he becomes integrated into the meta. For more information on the Secret Weapon’s lore and gameplay, check out the official Riot post. Reminder: New League of Legends champions are now priced at 7800 Riot Points for their first week of availability After a week, they drop to the normal 6300. We’ll update you on what champions are having their price reduced once Zac has been released.